Familial dysautonomia (FD) is an inherited disorder that affects nerves throughout the body. FD is passed down through families (inherited). A person must inherit a copy of the defective gene from each parent to develop the condition. FD occurs most often in people of Eastern European Jewish ancestry (Ashkenazi Jews). It is caused by a change (mutation) to a gene. It is rare in the general population. FD affects the nerves in the autonomic (involuntary) nervous system. These nerves manage daily body functions such as blood pressure, heart rate, sweating, bowel and bladder emptying, digestion, and the senses. After 3 years old, most children develop autonomic crises. These are episodes of vomiting with very high blood pressure, racing heart, fever, and sweating. Blood tests are available to check for the gene mutation that causes FD. Advances in diagnosis and treatment are increasing the survival rate. About one half of babies born with FD will live to age 30. Call your provider if symptoms change or get worse. A genetic counselor can help teach you about the condition and direct you to support groups in your area. Genetic DNA testing is very accurate for FD. It may be used for diagnosing people with the condition or those who carry the gene. It can also be used for prenatal diagnosis. People of Eastern European Jewish background and families with a history of FD may wish to seek genetic counseling if they are thinking of having children. Sarnat HB. Autonomic neuropathies. In: Kliegman RM, Stanton BF, St. Geme JW, Schor NF, eds. Nelson Textbook of Pediatrics. 20th ed. Philadelphia, PA: Elsevier; 2016:chap 615. Wapner RJ, Dugoff L. Prenatal diagnosis of congenital disorders. In: Resnik R, Lockwood CJ, Moore TR, Greene MF, Copel JA, Silver RM, eds. Creasy and Resnik's Maternal-Fetal Medicine: Principles and Practice. 8th ed. Philadelphia, PA: Elsevier; 2019:chap 32. Humans typically have 23 pairs of chromosomes, or 46 chromosomes in total. 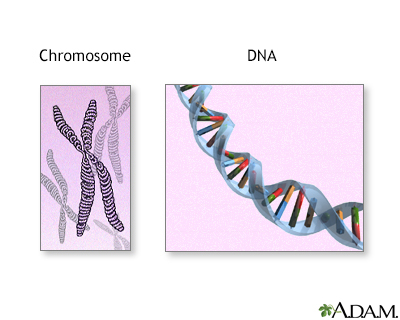 Chromosomes are made up of long strands of DNA, which contain all the body's genes.